Très bel hôtel, très bien situé et parfaitement équipé. Le manager de la réception nous a accueilli avec sourire et sollicitude. Nous tenons particulièrement à le remercier pour ces merveilleuses attention quand il appris que nous étions en voyage de noce. 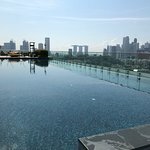 L’acces A piscine jusqu’a 23h est très agréable après une journée dans Singapore. Thank you for sharing your 5* experience with us. We are delighted to hear that you have enjoyed our central location, delectable breakfast buffet, the excellent service provided by our friendly team and our award-winning rooftop infinity pool. Indeed, our rooftop infinity pool is amazing as it has beautiful panoramic views of the city skyline which makes it the perfect place to unwind and relax and to take Instagram-worthy moments. It is definitely our favourite spot in the hotel. Look out for our hotel robot, Jeno for your next stay with us as he might just be the one swinging right by your doorstep delivering your in-room dining orders or room amenities. We hope to see you again soon. Thank you for sharing your excellent experience with us. We are delighted to hear that you have enjoyed our central location, well-appointed rooms, our award-winning rooftop infinity pool and the excellent service provided by our friendly team. Indeed, our rooftop infinity pool is amazing as it has beautiful panoramic views of the city skyline which makes it the perfect place to unwind and relax and to take Instagram-worthy moments. It is definitely our favourite spot in the hotel. Look out for our hotel robot, Jeno for your next stay with us as he might just be the one swinging right by your doorstep delivering your in-room dining orders or room amenities. We hope to see you again soon. clim difficile a régler , trop de froid ? JENO le robot est disponible 24H/24H pour nous apporter ce que vous avez demandé ! Thank you for sharing your fantastic experience with us. We are delighted to hear that you have enjoyed our central location and our efficient robot, Jeno. Indeed, we are well-located in the heart of Orchard Road, situated right above Somerset MRT and connected to 4 major shopping malls with a 24-hour Japanese Supermarket. We hope you managed to spend some time at our award-winning rooftop infinity pool with stunning panoramic views of the city skyline which makes it our favourite place in the hotel. We have also informed the team about your feedback and we will definitely act on it the soonest to give you the best experience for your next stay with us. Your valued feedback will help us greatly. We hope to see you again soon. Je descends assez régulièrement dans cet hôtel. Très bien situé sur Orchard. Attenant à un centre commercial avec boutiques et restaurants très pratique. Magnifique piscine sur le toit. Petite salle de gym ... pas assez grande pour l’hôtel je trouve. Très beau buffet pour le petit déjeuner. Rien à dire ! C’Est une bonne adresse. Thank you for sharing your perfect review with us. We are delighted to hear that you have enjoyed our delectable breakfast buffet, central location and our award-winning rooftop infinity pool with amazing panoramic views of the city skyline. Indeed, we are well-located in the heart of Orchard Road, situated right above Somerset MRT and connected to 4 major shopping malls with a 24-hour Japanese Supermarket. Check out our new Shangri-La Application on your smartphone devices for your next stay with us as you will be able to do a mobile check-in and check-out which is very efficient. We hope to see you again soon. Ma femme et moi avons séjourné 3 nuits dans cet hôtel. Les chambres étaient modernes, spacieuses et très confortables. Elles étaient très propres. L’hôtel est très bien situé. A 6-7 kilomètres à pieds de Chinatown ou de Marina Bay Sands. La station de métro Somerset est dans le centre commercial sous l’hôtel. Le rooftop est le gros gros point fort de cet hôtel. Un bar, avec une piscine à débordements. Et une magnifique vue sur Singapour et le Marina Bay Sands. Je recommande très très fortement ce lieu. Thank you for sharing your excellent review with us. We are delighted to hear that you have enjoyed our well-appointed rooms, central location and our award-winning rooftop infintiy pool. Indeed, our award-winning rooftop infinity pool is the best part of our hotel and also the best one that you can find in the city. 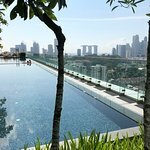 It is an urban oasis in the midst of the busy Orchard Road and it also has breath-taking views of the city which makes it the perfect place to take stunning social media worthy photos. Look out for our hotel robot, Jeno for your next stay with us as he might just be the one swinging right by your doorstep delivering your in-room dining orders or room amenities. We hope to see you again soon. Extrêmement bien situé nous avons passé 3 nuits dans cet hôtel très calme et de très bonne tenue. 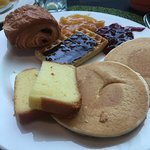 Que dire du buffet du matin, somptueux et gargantuesque...du sucré, du salé bref excellent! Le must, la grande piscine sur le toit au 19eme étage avec une vue époustouflante ! 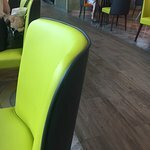 Le petit plus très appréciable, garde bagage le dernier jour et nous avons pu profiter jusqu’au dernier moment de la piscine et des douches avant de prendre notre avion tard le soir ! Thank you for the fantastic review. We are so delighted to hear that you have enjoyed the facilities and services provided by us. Indeed, our award-winning rooftop infinity pool is the best part of our hotel and also the best one that you can find in the city. 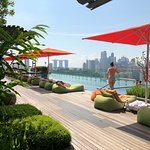 It is an urban oasis in the midst of the busy Orchard Road and it also has breath-taking views of the city which makes it the perfect place to take stunning social media worthy photos. Do check out our new Shangri-La Application on your smartphone devices for your next stay with us as you will be able to do a mobile check-in and check-out which is very efficient. My team and I look forward to your next stay with us. Have a great week ahead.